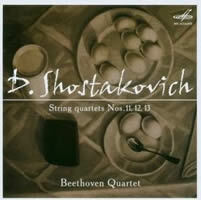 Dmitri SHOSTAKOVICH: String Quartets 1-15; Two Pieces for String Octet, Op. 11 (1924-5). Beethoven Quartet; Komitas Quartet (Octet only). Doremi DHR-7911-5 (http://www.doremi.com/). 5CDs. Distributed in the US by Allegro (http://www.allegro-music.com/). I’m delighted we have Borodin I’s account of the first 13 Shostakovich quartets (Chandos CHAN 10064  H), and intégrales from the Taneyev (Aulos AMC2 0551/6) and Fitzwilliam (Decca 455 776-2). All three enjoyed some contact with the composer but his prime interpreters, the Beethoven, haven’t been well served on disc until now. Admirers of the oeuvre (so modern in its evasions and shadings, while seemingly more advanced styles have passed into history) should not hesitate. These superior renditions didn’t receive their due at the time, either. In the LP era, they were taped at the Ostankino radio studios shortly after the premiere of each quartet with the composer in attendance. Produced as needed over a lengthy period (1956-74) rather than like a contemporary intégrale (en masse) seems a point in their favor, at the risk of obscuring the achievement. Formed in 1922 as the Moscow Conservatory Quartet, the Beethoven got its permanent name in 1931 along with recognition as the top Soviet quartet — seven years before Shostakovich wrote his first. Their final rehearsal of that work so impressed him that they became partners. (Until No. 15, when a death intervened.) He maintained his Piano Quintet (1940) could easily have been another quartet, but he wanted a piece he could play on stage with them. 1) Fleet tempos, mostly 2) Led from the top (violinist Dmitri Tsiganov) down 3) Notably exacting in ensemble 4) A lean corporate sonority — unison not masking individuals 5) Unchanged as a unit for 42 years. As expected, Doremi’s transfers are worlds more gracious and revealing than the rough CDs of this material the short-lived Consonance label issued in 1994. (Since this set lacks specific session info — abysmal in a serious release — one can’t be certain they are in fact the same. Consonance couldn’t locate a tape of the Fifth, which figures here.) Tolerance is required only on the Ninth Quartet, which has to fight through a band of noise that apparently couldn’t be extracted from the signal; it diminishes as the work proceeds. Recording quality of course picks up with the passing years. The last two discs, catching the quartet at peak concentration, are free of sonic red flags. A certain edge to the string tone varies little across the spectrum — group signature or standard on Soviet recordings of the time? Probably some of both. Bitterly debunking when celebrating victory was the order of the day, one marvels that the Third Quartet didn’t land Shostakovich deeper in trouble than it did. 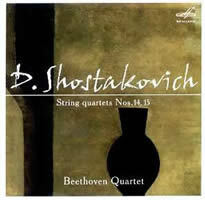 Structural echoes of the Eighth Symphony (1943) are apparent in this most orchestral of his quartets. The Beethoven’s weighting of the score’s events is at odds with those working on their own — more deliberate, less bruising and anticipating. Many details like the underlined opening note of the fourth-movement passacaglia bring the image of the seated composer nodding. The following succession of choruses and anguished solos slays the war machine’s vigor and the finale, a procession of the dead, is daringly hushed. A roomy acoustic and generalized mono let down the conception somewhat, making those distinctive pizzicati hard to place. It’s possible to prefer Borodin I’s fuller sound and forthright throbbing, but I don’t. Done in just 22 days, the Fifth was a present for the Beethoven on its 30th anniversary: “Dear friends, please accept this modest gift as testimony of my admiration of your wonderful art, of my deep gratitude for your splendid performance of my works, and my great love for you.” The affection was real, but modest it isn’t — an epic display of force to put beside the Third. 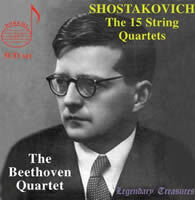 In three long movements (10:35, 9:08, 10:12) Shostakovich plays to the quartet’s strengths, incisive authority and a knack for stamping out convincing moods. Struggles over key and tempo (violins against a stubborn viola, the cello annoyingly splitting the difference) eventually throttle a promising waltz and restore order. The Third’s shattering ghost music here serves a different purpose, and strong if confusing episodes vie for dominance. The Fitzwilliam is remarkable (in fine sound), but its strands stay discrete — not quite the Beethoven’s snapping discord. Quartets 11-14 each bear a dedication to a founding Beethoven member and spotlight his instrument. The viola entry, next to last, is highly unusual — an unbroken Adagio built from a tone row. Vadim Borisovsky was the eldest and first to leave (1964), in part because in Fyodor Druzhinin (b. 1934) he had a brilliant student ready to take over. Years later Shostakovich overheard Druzhinin ascend to a high B flat in the third octave (securely bowed, not a harmonic) during warmup, and asked some technical questions. It would become the climax to the 13th. The viola solos hold things together until glue and added weight arrive halfway along, and only a very dull violist could fail to make that final liftoff grab one by the throat. The Taneyev’s 15:22 feels impetuous and (well) pissed off; Borodin I’s slow, heavy tread (19:56) results in a teary funeral march. At 18:16 the Beethoven elucidates the structure, and Druzhinin’s leads, pulsing yet firm, remain unique. I covered the Beethoven’s No. 15 here. That CD (Le Chant du Monde PR 7254043) reportedly took the performance off their Melodiya LP and assigned a fictional source. (It’s still valuable for the Glinka Quartet’s expansive angle on No. 14.) With less between us and the playing than before, the unforced gait (37:24) and “gun-metal grey” palette (W. Mark Roberts, DSCH Journal) command as does no other version. New cellist Yevgeni Altman (Sergei Shirinsky passed away suddenly after a rehearsal) betrays no qualms and fits snugly into the proceedings. The final leavetaking in the last of six Adagios goes without emphasis and is all the better for it. My title was the composer’s reaction to the Beethoven’s run-through of his Ninth Quartet. That evening also marked Druzhinin’s debut in the viola chair. Getting the scores for the Ninth and 10th Quartets in the afternoon, he later sight-read them in the group with Shostakovich seated at his side. (No pressure!) This nugget comes courtesy of Elizabeth Wilson’s volume of testimony, Shostakovich: A Life Remembered (Princeton University Press, 1994). They’re carried by MDT (http://www.mdt.co.uk/MDTSite/pages/home/default.asp), a superb U.K. classical mail-order house. Unheard by me (as yet) — I may report later.